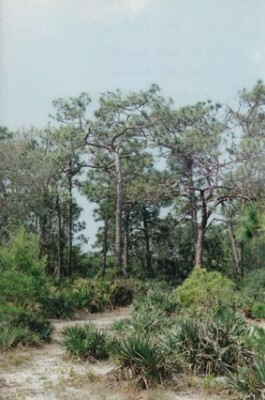 Scrubby pine flatwoods in South Brevard County, Florida. Photo by Kevin Dodge. Our 2012 Guide for Real Florida Gardeners features an article on Kevin and Mala Dodge of Melbourne, Florida, and the transformation of their home landscape to a Real Florida yard. Kevin and Mala began their adventure around 2005, after some years of frustration with non-native plants. 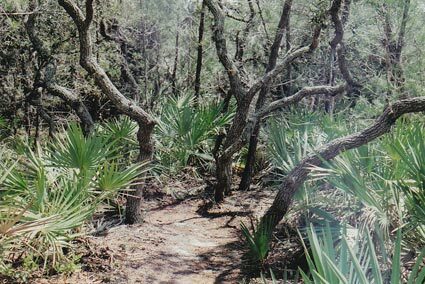 The Dodges live along the Atlantic Coastal Ridge, in an area of high, dry scrub, remnant sandhill, scrubby pine flatwoods and xeric oak hammocks. Walking in a local park one day, Kevin had an epiphany: why not use the same plants that Mother Nature chose? Those plants were doing just fine without a sprinkler system or lawn service. Kevin began a study of his hometown’s native plant communities, walking in the woods every chance he got, snapping pictures of landscape vignettes that he liked, and making notes on what occurred where and how this compared with the soils in his own yard. You can do the same in your hometown – visit local nature parks and see what grows naturally. Then visit your local native nursery to find out how you can bring nature home. The snapshots below are just a few taken from the Dodge family’s journey from lifeless turf to life-filled native landscape. Above: close-up of the Dodge family refrigerator door: in the middle, the photo that started it all. Kevin kept a photo log from all the natural areas he visited, and this photo stayed on the refrigerator as a reminder of the "look" he wanted to achieve in his new native landscape. 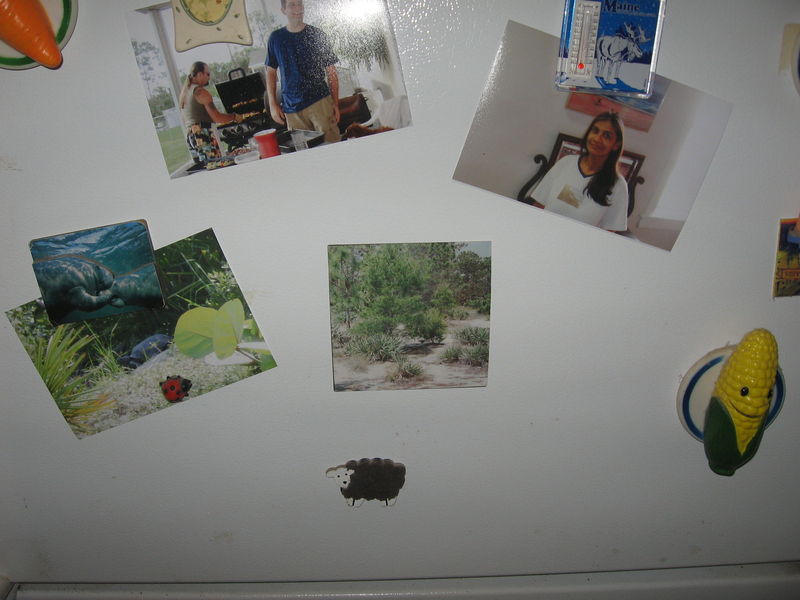 Above to the right is wife Mala, and to the left, under the manatee magnet, is "Kurma" the gopher tortoise, who came to the yard, dug a burrow, and stayed a few weeks in the fall of 2011. Above: mix of pines and oak trees with Saw Palmettos scattered throughout. Pine needles cover the ground. The oak hardwoods may be overtaking a former pine flatwood that is no longer subject to wildfire. Photo by Kevin Dodge. See Kevin's notes below, written on back of the photo. Kevin routinely documented his findings on the back of his snapshots, noting plant species encountered, their natural spacing and arrangement, soil conditions and groundcover. 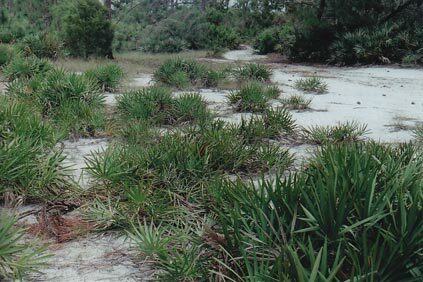 Above: Saw Palmettos in scrub area. Photo by Kevin Dodge. 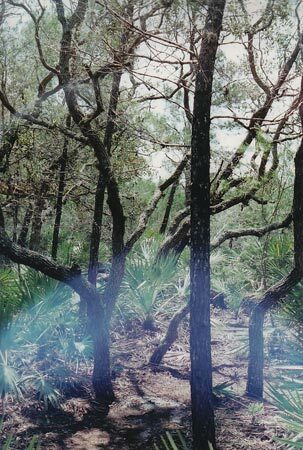 Kevin's notes on back of photo: "Saw palmettoes (sic) do well with a mulch layers (sic) of pine needles, or in this case, just plain white sand. *upper left corner is a sand pine." 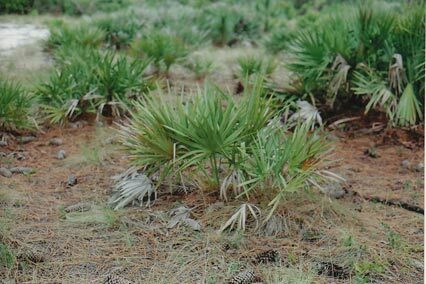 Above: Saw palmetto plant. Photo by Kevin Dodge. 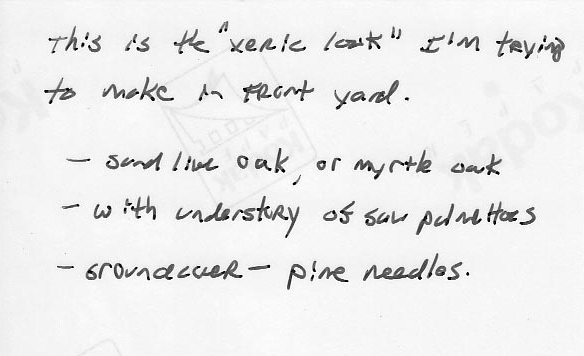 Kevin's note: "saw palmettoes (sic) with a natural mulch layer of pine needles"
Kevin's note: "Xeric hammock, dominated with oak and saw palmettoes (sic). note close proximity of trees to each other 4 to 6ft."